My neighbor Joey said he used to love to ride bikes and wanted to get back into it. I offered a 30 mile ride with breakfast. He accepted. 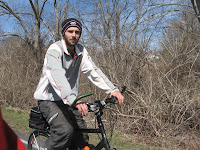 We drove to Providence R.I. to the East Bay Bike Path. It's a 13.5 mile flat route that parallels the Providence River before winding through the New England historic towns of Barrington, Warren and Briston R.I.
Warren R.I. was the home of American Tourister luggage. They merged with Samsonite and thrived for many years. #2 son Todd spent a few year in marketing for them. Unfortunately, the US business dried up. They are very big in Europe, but here, pehhh. We stopped for breakfast in Warren and rode around the town ohhhing and ahhhing the sites. On the way to Bristol, R.I. we side tracked into Colt State Park. Lots of history in the park, and lots of animals. Ram, sheep, lions. We came across a pretty nasty looking car accident. Immediately one could tell there were no injuries, but the nice new sports car looked like the letter V when they removed it from the telephone pole. As we passed the traffic control, there was a young woman of around 20 on her cell phone. I overheard her telling dad, (I presume), "I was looking at the ducks, looked back to the road and there was a telephone pole there". In Bristol, Joe and I took in the sights including a very old Puritan Church, dating to the mid 18th century. Also the Bristol Veterans Memorial. The thirty five mile ride took us almost four hours to complete, with two and a half being saddle time. Much more than the eight minutes I needed to complete my fundraising commitment. Here are the photos posted a little differently. Hope you like. Great photos! I like this sort of slideshowesque presentation. 30 miles is a pretty good ride, especially for someone who's just trying to get back into it. Heck, that's a good ride, period. Stopping to see a lot of stuff along the way sounds like a lot of fun. It looks like Joey is a smoker -- I used to be, until last year, when I started mountain biking. That was a great distraction from the misery of nicotine withdrawal. I don't know what his plans are, but maybe biking can help him quit the same way it helped me. Also, I see you have a Quit Smoking Support link, are you an ex-smoker? Joey smoked a pack of cigarettes in the four hours we were together. He was a bmx trick rider and simply stopped doing it. He wants to do some touring and is just getting back into riding. I am a moderator at quitsmokingjournals.com and have been off butts for 5+ years. Heh, "Michael" is really Apertome. I'm having all kinds of trouble with blogger's accounts lately. Sorry for the confusion! To be a noble charitable being is to have a make of openness to the world, an gift to trust aleatory things beyond your own restrain, that can take you to be shattered in hugely exceptional circumstances pro which you were not to blame. That says something exceedingly outstanding relating to the condition of the principled autobiography: that it is based on a trustworthiness in the up in the air and on a willingness to be exposed; it's based on being more like a spy than like a jewel, something kind of dainty, but whose mere particular beauty is inseparable from that fragility.